Funds are desperately needed to help support a range of new and on-going activities to conserve great apes and to help the people living alongside them. Individuals, companies, institutions, government aid agencies... all can provide vital support to our work. Whatever amount you can give will help! CHF 10 (€7) - allows a child to participate in a wildlife club school trip to a reserve. CHF 60 (€40) - pays a month's salary for an anti-poaching ranger. CHF 100 (€70) - provides fuel for 2 months for a project education officer to visit local schools and organize slide shows and drama groups to raise awareness of great apes. CHF 200 (€140) - buys a year's supply of clothing and equipment for a ranger (e.g. waterproof clothing, sleeping bag, boots, rucksack). CHF 600 (€420) - pays for the cost of monitoring one gorilla group for a month. CHF 900 (€600) - pays for the production of environmental education materials (e.g. books, leaflets, posters) for local schools. CHF 1,200 (€800) - pays for the training of a park guard. CHF 5,000 (€3500) - pays for the demarcation of a new sanctuary. 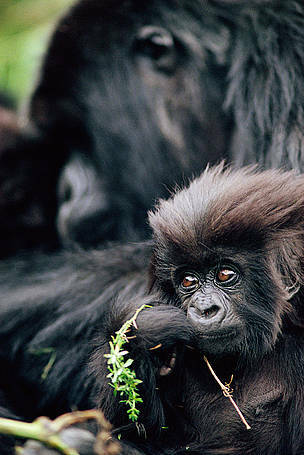 Help Africa's great apes today! Visiting gorillas. Money earned through gorilla tourism contributes significantly to the conservation of the species – providing funds for conservation projects and creating jobs and bringing other benefits to local communities living near gorillas. To visit the gorillas of Dzanga-Sangha in Central African Republic, contact: info@dzanga-sangha.org. Buying sustainable wood. By purchasing FSC-certified forest products, consumers, retailers, traders, and manufacturers help protect great ape habitat by encouraging sustainable forestry and limiting illegal logging. Without the FSC label, your timber may well stem from illegal or controversial sources in central Africa. Spreading the word! Click on the button to share this information with others via email or your favourite social networking service.